STRIP BOUND REPORTS provide a sophisticated professional look, excellent for legal briefs, transcripts, financial reports, and more. 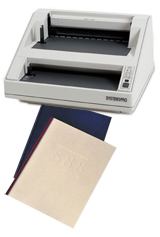 There are two different types of Strip Binding Machines. The Hot Knife Machines use an 11-prong strip that provides a secure tamper-resistant bind which is difficult to edit. The Cold Knife or Personal/Desktop Machines use a 4-prong strip which allows you to open and close the same strip for easy editing of pages. Hot-knife strips and Desktop strips are NOT compatible. If you need additional information, contact us at 1-800-443-7557. FREE SHIPPING ON ALL VELOBIND MACHINES. Uses 4 Prong Recloseable Strips. Electric Punching and Manual Binding. Punches up to 24 Sheets of 20# Paper and Binds up to 200 Pages. The VeloBind System One gives added security to your binds. Manually Punches 20 Sheets of 20# Paper and Binds up to 1” in Thickness, about 250 Pages.